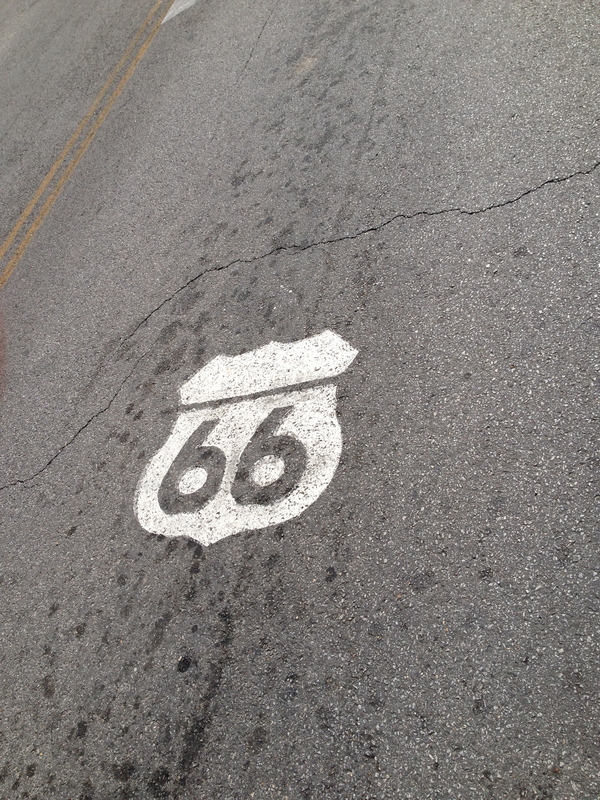 Where does one begin the pursuit to run 66 miles on Route 66 at age 66? Somewhere in the middle of course, at the Mother Road Marathon. I opted to save Oklahoma for another day and began the Half in Baxter, Kansas. 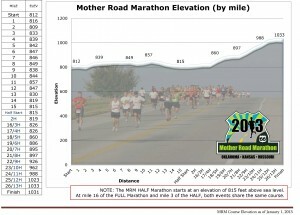 The Mother Road is a small marathon, 139 marathon finishers and 250 finishers of the half this year. Yet, it operates as smoothly as large marathons I have run and offers all the percs without the elbow-to-elbow start. My Mother Road experience began at the Springfield/Branson airport where my sister greeted me and drove us to our first stop at Joplin City Hall for packet pickup. There was a small expo with sponsor and organization information and product tables. Next stop to the LaQuinta, the marathon hotel. Race morning, a light continental breakfast was available to runners beginning at 4 a.m. Volunteers were on hand to welcome runners on the shuttles to the Joplin Athletic Center. Shuttle service began at 5 a.m. From the Athletic Center, we transferred to buses for either Baxter KS for the 1/2 start, or to Commerce, OK for the full. From a runner perspective, the shuttles ran smoothly, always departing and arriving as scheduled. A light rain stopped as our shuttle arrived in Baxter. The morning was cool so I pulled a stowed trash bag over my head and placed my jacket in a carryall provided by the race. I handed it off to at bag check and made my way to the start. The rain stopped and I passed the trash bag on to a shivering rain-drenched runner caught in an earlier downpour. A few words from the mayor, a prayer, the anthem, and we’re off for our 13.1 miles. The first few miles were flat roadway, with a short distance on a water-logged trail where we merged with full marathon runners. Back to the road, the wind was at 10 mph, in our faces and cool. In shorts sleeves and short tights, I was comfortable but could have used a pair of light cotton gloves. The road ahead was going up, up, up. The first half of this marathon is relatively flat, changing to a slight uphill for the second half. I can handle hills, but although shallow, these didn’t seem to end. The expected downhill when we peaked was nonexistent, only a plateau before the next hill. 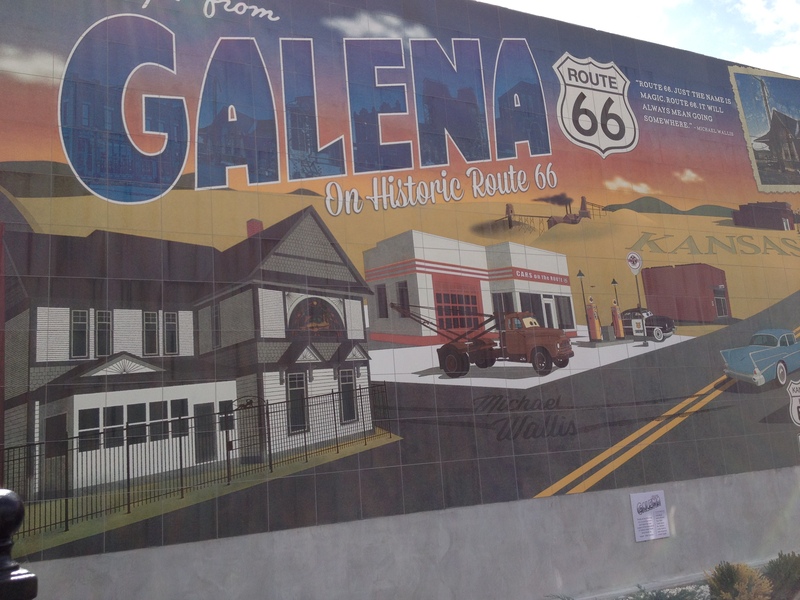 Around miles 7/8, a snake-like bend through the town of Galena was a colorful reprieve from that straight ribbon of highway. Cheering folks in lawn chairs lined the main street. Runners meandered through a section where paving was worn and cracked. 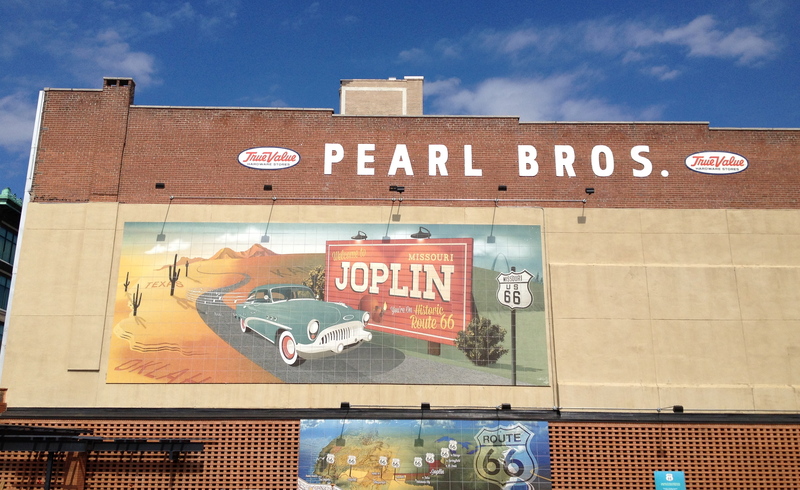 A sign cautioned to watch our footing – we were running on the original roadbed of Route 66. Soon enough we were back out to the smoother but less scenic main highway. Plentiful porta-potties and water stations were staggered along the hilly route. Approaching the finish, there was a sizable crowd and an announcer calling the names of first-time 1/2 and full marathoners. My finish was a 2:06, eight minutes shy of my 1/2’s in 2012. This was my first race to rebuild distance, next working on my time to sneak back under that 2-hour mark. It’s a short walk to the food tent where a variety of fresh fruit and energy bars were available. The only thing missing was the hot cup of coffee that I crave post-run. The atmosphere was festive with 5K participants mixing in. Beer and pizza were available for runners and a live band played some classic rock numbers. I retrieved my drop bag, picked up my AG medal and continued up a grassy hill for the hotel shuttle pickup. From the runner perspective, this event looked flawless. 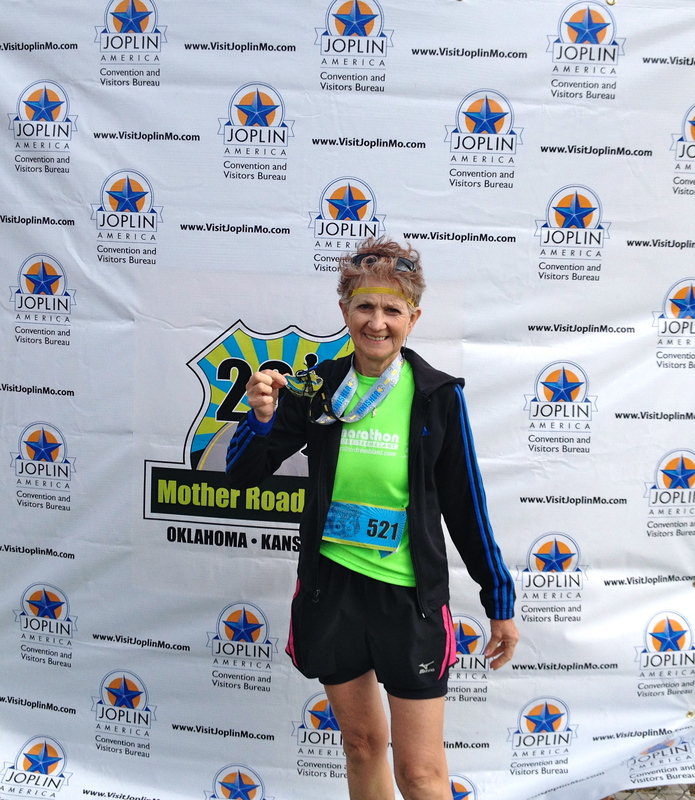 The details required for planning a course through three states and multiple municipalities, synchronizing a marathon and half marathon with a 5K going off in Joplin takes a skilled and dedicated race committee. Congratulations to the Mother Road Marathon and all of the sponsors and volunteers that helped to achieve a seamless and historic race experience. Next post, I’ll report on the travel, food and sightseeing that are the wonderful side benefits of destination races. Mary Lou, you are a gem. Thank you so much for so articulately telling the tale–and for being a model. You’re welcome. It was my pleasurel. Congrats Mary Lou! Sounds like a great race. Thanks, Kelly. It’s high on my ‘recommend’ list. Gosh, you`re a flyer.Well done, excellent time! Thanks, and yes – it’s time to unpack the dufflebag for a couple of weeks. Sounds like a fabulous race (except for the never-ending uphill)! Yes, it taught me that because I can run hills that are steep but short doesn’t mean I have a lock on the long and low. You’re right. Looking forward to it. Glad you had a good Thanksgiving, enjoying the outdoors with family. I love your 66/66/66 goal. 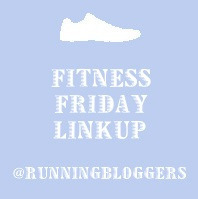 Such a fun idea and quite inspiring! It is fun – and sort of frugal. I have friends and family in several states near Route 66 to call on. Great Report! 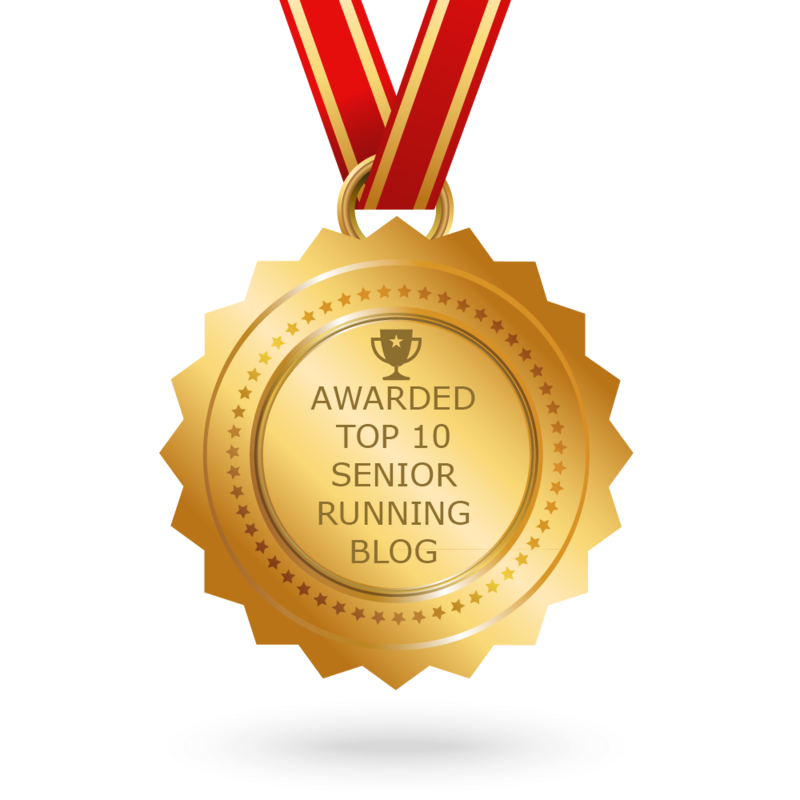 And that really is a great time for a runner of any age! Congrats. You are right that long inclines can many times be more trying than short steep hills.. I have had the same experience. They just take it out of you and you are really hoping to get back to the flats or downhills but it just keeps going up. It is unusual to do a 100 miler on the road, so it was well known. It was also a fast 100 because it is easier to move on asphalt than on dirt and rocks. Thanks so much for the report. I may have to consider this one someday! Thanks. 100 miles in one direction would be tough. Since highways are slightly canted to allow for runoff, I was careful to stay on the flattest surface. Uneven surfaces for me begin to cause muscle strain. My compliments to anyone who finished that 100-miler. Congrats on your race! Good for you for running such a great time on a hilly course! I struggle with both short steep hills and long slow climbing hills! Thanks. My home running turf is hilly so the steep short hills don’t phase me any more. I have more difficulty with an absolute flat course in anything longer than a 5K – not a problem with this race.